A friend I rode with down in South America just emailed me last night and asked about luggage fees for snowboards on flights to Portland. Don't you miss the days when checked luggage was free and allowed for more than once piece? Now that fuel prices have dropped I don't see any airlines waiving the fees which I guess is better for the health of the industry but still a pain for their customers. Remember to factor in the fees when you are hunting for flights, looking back I would've gone for a slightly more expensive flight than deal with shoddy airlines and their fees. Anyway, for those of you traveling with your gear, there's a great resource over at SnowPak. They give you a run down of all the airlines and their individual policies toward gear as well as the costs associated with it. They even include a time stamp of when they last updated. If you are unfamiliar with the area you are flying into, you can search for nearby resorts via lift ticket prices and proximity at LiftSift. Wish they also included links to deals / coupons and other methods of getting cheaper tickets but it's still better than nothing. 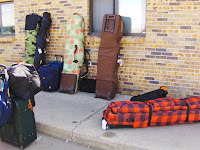 Finally, check out this old post by Shay on packing for your trip. Just gives you a sense of what you need and how to cram it all in. If you don't have a snowboard bag I recommend the Dakine Low Roller.